Hover over the markers on the map at right, or choose from the locations below to discover more about the Gardens. Do not feed the birds. Bread and other human foods can make the birds sick, and offering food discourages the birds' natural foraging behaviour. Fishing is not permitted at any of the lakes within the Gardens. Fishing lines are hazardous to waders and water birds. Dogs are not permitted in the Gardens (including the Centenary Lakes area). The rainforest Aboriginal people were hunter gatherers. They used rainforest plants as a major source of food, for shelter, medicine, clothing, utensils, tools and weapons. Over a period of more than 40,000 years they developed an extensive and detailed knowledge of the properties and uses of rainforest plants. The Aboriginal Plant Use Garden is a short walk located within the Flecker Garden, and showcases many of the local plants that were important to the local inhabitants. Along this walk you will see some of the plants used by the various groups of rainforest Aboriginals who lived in the Cairns to Mareeba area. Download the Aborignal Plant Use Garden brochure ( PDF, 1.81 MB ). Bamboo is an important plant in many cultures serving a diverse range of uses from food and construction material, to paper pulp, handicrafts and musical instruments. Temperate species of bamboo generally display a running character, which makes them very difficult to control in a garden environment. A good example is the fish pole bamboo (Phyllostachys aurea) from China which can be seen at the start of the Mount Whitfield Conservation Park. Most of the bamboos cultivated at Cairns Botanic Gardens are tropical species which tend to be clumping in habit. The enormous size of some species such as Dendrocalamus giganteus, makes these plants only suitable for large gardens or parks. With culm diameter measuring up to 25cm and height up to 30 metres, it is an imposing feature in the landscape. The Fitzalan Gardens are named after Mr Eugene Fitzalan, the first caretaker (1886-1897) of the Botanic Gardens. The area comprises three separate gardens connected by paths and footbridges, and houses a small water lily pond, giant mature palms and trees planted many years ago. The gardens are designed to hide several nooks and crannies, offering you private spaces to relax and enjoy the atmosphere. You can access Fitzalan Gardens across the road from either the main entrance of the Flecker Garden or the Visitor Centre. 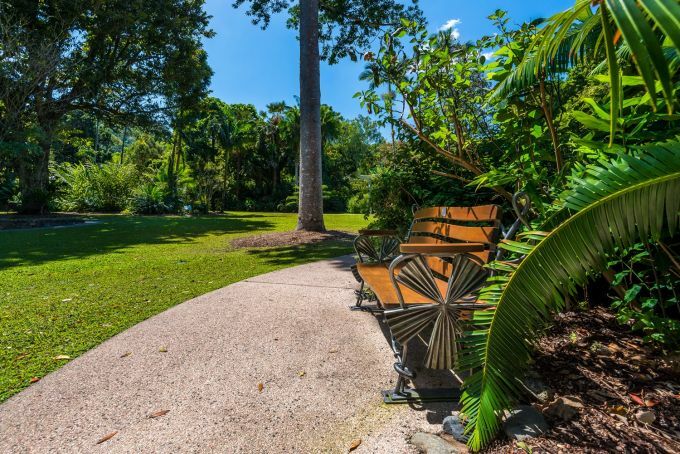 Flecker Garden epitomises the diversity of tropical flora that can be found across the world's tropical regions including plants from the steamy jungles of South East Asia, South America, Africa and of course Tropical North Queensland. 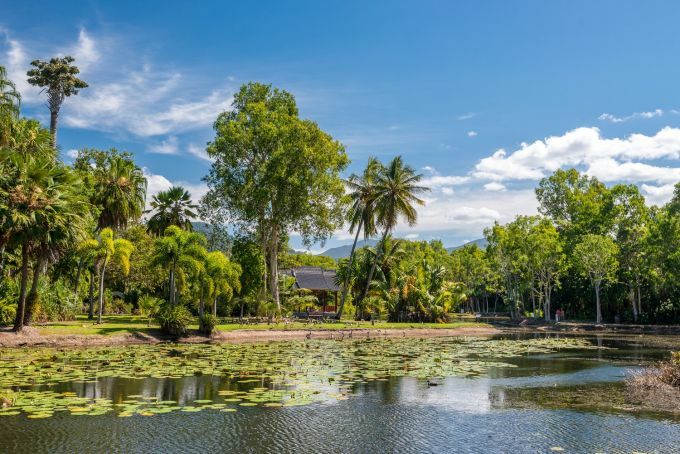 Freshwater Lake, established in 1975 to celebrate the Cairns City Council centenary, was created from a three hectare freshwater swamp that originally existed on the site. The lake is decorated by a patchwork of water-lilies (Nymphaea sp.) that provides shelter for several species of frogs, fish and turtles. A swampy, safe haven, the lake is also home to many bird species and, depending on the season, visitors can expect to see magpie geese, black ducks, black-necked storks and cormorants. The Freshwater Lake is an ideal place for a family outing with sheltered picnic sites, free BBQs, a children's playground and public toilets. 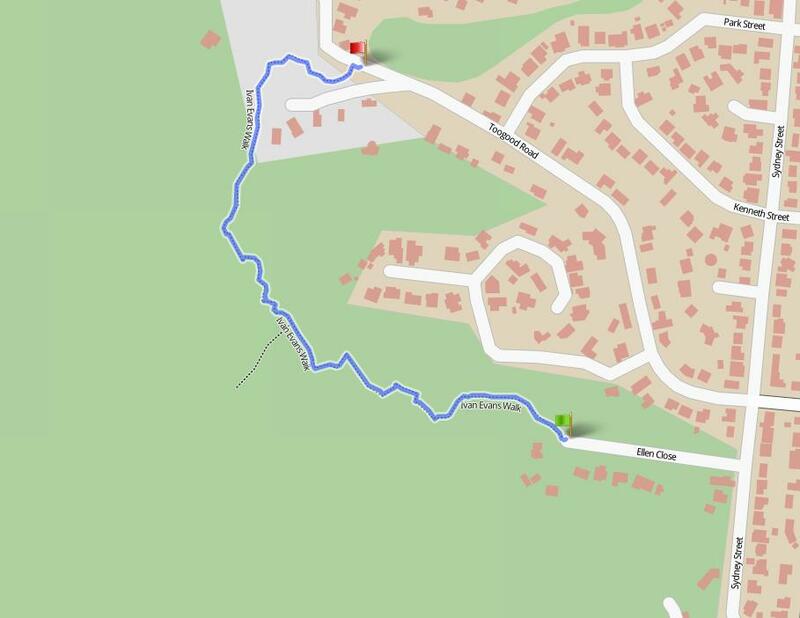 The Freshwater Lake can be accessed by road from Greenslopes St or by foot along the Rainforest Boardwalk. Note: Fishing is NOT permitted in any of the lakes within the Gardens. This includes fishing for the invasive species Tilapia. Fishing lines are hazardous to the lake's resident native birds and waders. Located between Flecker Garden and the Visitor Centre, the Gondwanan Heritage Garden is an Evolution Garden tracing the evolution of plants from the first photosynthetic bacteria to the modern flowering plants. Emphasis is placed on the Gondwanan component of the plant kingdom and in particular the development of the distinctive Australian Wet Tropics flora. The garden is divided into zones representing different stages of plant evolution. Start the trail at the interpretive shelter, learn how the modern continents evolved, examine the fossil record and trace the changes in plants from the beginning to the present day. Then follow the Zones and meet the survivors of this long journey. Download the Gondwana Heritage Garden explanatory brochure ( PDF, 1.04 MB ) . This information can also be found at the start of the trail and printed copies of the brochure are available from the Visitor Centre. 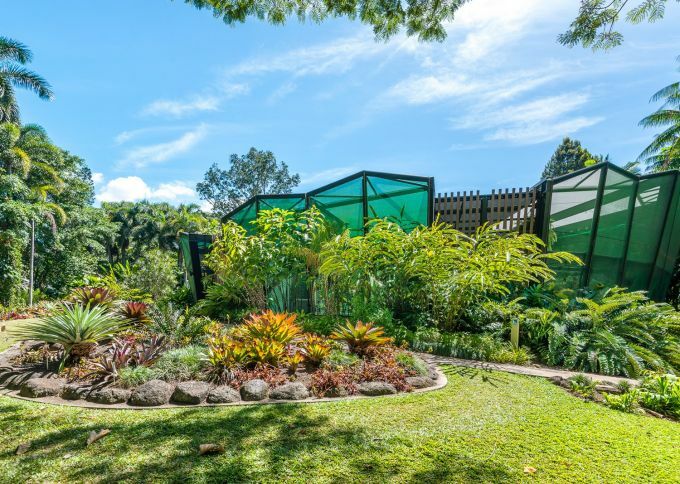 Located within the Friends of Botanic Gardens House in Flecker Garden, the Library houses botanical and horticultural books and other publications relevant to tropical gardening. In operating the Library, the Friends of Botanic Gardens provide plant science resources and accurate information to users by collecting, organising, preserving, and sharing subject-specific materials for current and future use. The Library is open to the public when the Friends of Botanic Gardens House is open. For more information, email fobgcairns@bigpond.com or phone (07) 4032 3900. Located at Freshwater Lake on Greenslopes St (near the Zhanjiang Friendship Garden), this is a children’s playground with a difference! 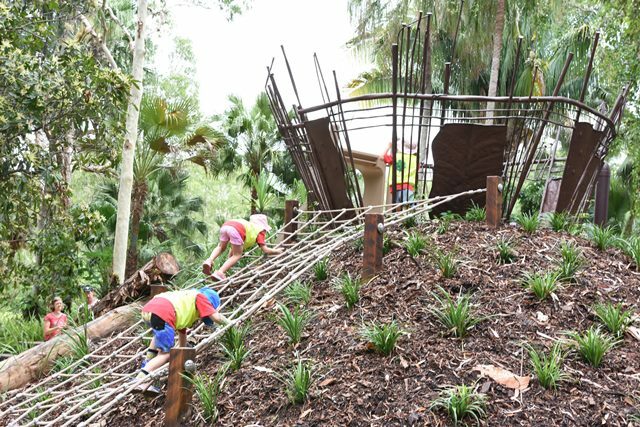 Integrating creative play elements with the natural lakeside environment, the Nature Playground encourages children to interact with nature, to explore and learn about their surroundings. There are dinosaur bones to uncover, ropes to climb, play huts to build, a fairy garden, rope climb, tunnels, balance logs, a digging patch and plants known for their bright colours, smells and textures to encourage sensory play. The boardwalk allows the visitor to imagine what the coastal areas of Cairns once looked like before settlement. Sadly, this shrinking ecosystem that once dominated the region has all but disappeared, apart from the small patch around the boardwalk and a few other locations. This special environment has been home for years to an endangered plant called the Layered Tassel Fern (Huperzia phlegmarioides) which once thrived in this habitat. It is now on the Queensland Government Endangered Species list and is becoming as rare as the ecosystem in which it lives. Apart from the amazing plant life existing along the walk, visitors should also watch out for the Lovely Fairy Wren (Malurus amabilis) which frequents the area. The western end of the boardwalk is located across Collins Avenue from the Main Gate. The eastern end is adjacent to the Saltwater Creek footbridge that accesses the Saltwater Lake. Saltwater Lake illustrates, on a small scale, the diverse saltwater ecosystems found in Cairns and its coastal surrounds. Filled by tidal waters from the adjacent Saltwater Creek, the lake displays the delicate balance that exists between water, plants and animals within a saltwater environment. The lake and creek are surrounded by mangroves that supply food to marine animals and provide breeding grounds for species such as prawns and mud crabs. They also provides habitat for many birds. Saltwater Lake grounds are planted with a wide variety of tropical fruit trees and shrubs. You will also find a raised, no-dig garden bed filled with tropical vegetables. Facilities in this garden include picnic shelters, BBQs and a children's playground. 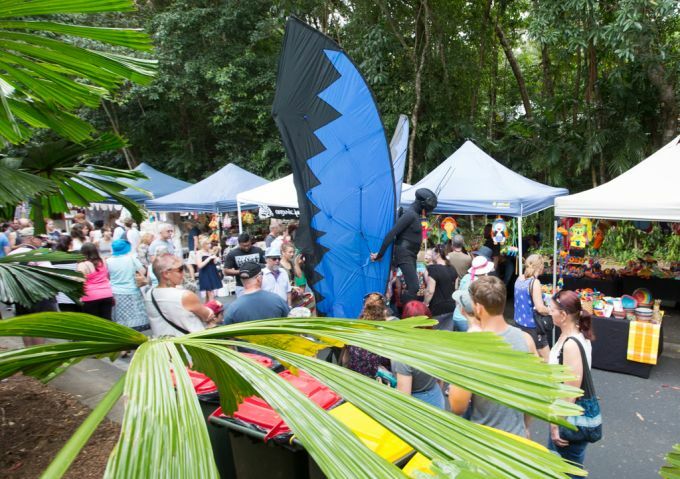 The Saltwater Lake can be accessed by road from Greenslopes St or by foot along the Rainforest Boardwalk. Culture and nature are entwined at Cairns’ premier contemporary arts venue. The Tanks Arts Centre incorporates music, performance, theatre and visual art with community events and engagement. Taking its name from the past, the site is literally comprised of three concrete fuel tanks that were completed in 1944 for the Royal Australian Navy. The tanks were decommissioned in 1987 and re-modelled into an arts centre by Cairns Regional Council. The venue opened its doors in 1995. To see current and upcoming events, or to learn more about the venue, visit the Tanks Arts Centre website. 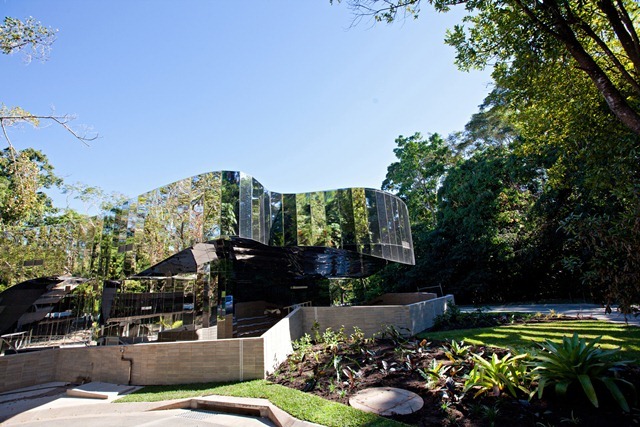 With its stunning reflective exterior, the Visitor Information Centre is a popular focus for visitor photos. Pop in to learn more about the Gardens, view an exhibition, take a class, or purchase a memento of your visit to the Cairns Botanic Gardens. Designed by Charles Wright Architects and opened in October 2011, the building has won numerous design, construction and sustainability awards. It features 104 solar panels (20kw system), its own rain catchment system (used for non potable areas), and louvres and fans to minimise the need for air-conditioning. The modern multi-purpose venue is available for hire. It incorporates an outdoor undercover amphitheatre and an air-conditioned multi-purpose room suitable for small cocktail functions, product launches, corporate seminars and community meetings. 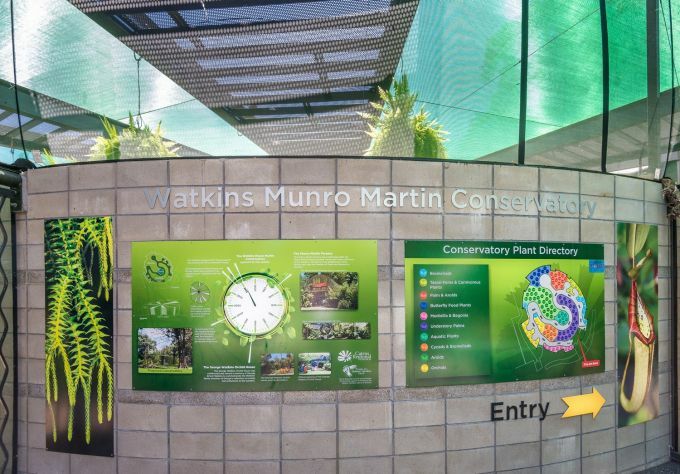 The Watkins Munro Martin Conservatory has been designed to resemble the iconic licuala palm (which is featured on the Cairns Regional Council logo). The structure was built in 2015 to safely house and exhibit some of the Gardens' most valuable and tender plants and a collection of local butterflies. 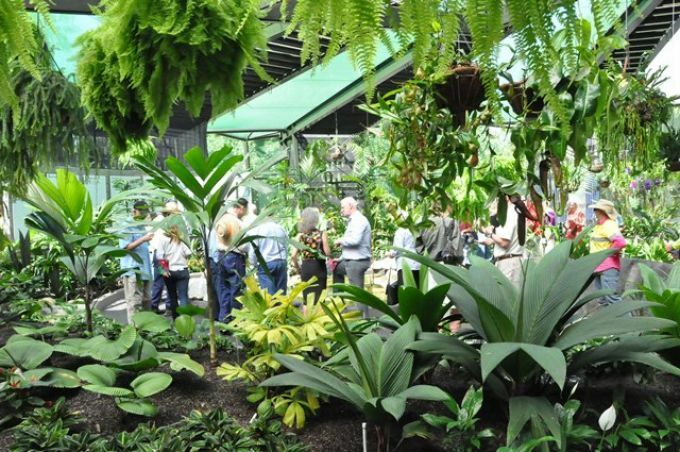 Inside the Conservatory, a one-way walking path meanders through carefully landscaped botanical displays featuring aroids - including the Gardens’ significant amorphophallus collection - as well as bromeliads, tillandsias, carnivorous plants, cycads, ferns, palms, orchids and tassel ferns. The Conservatory is situated inside Flecker Garden opposite the main gate. 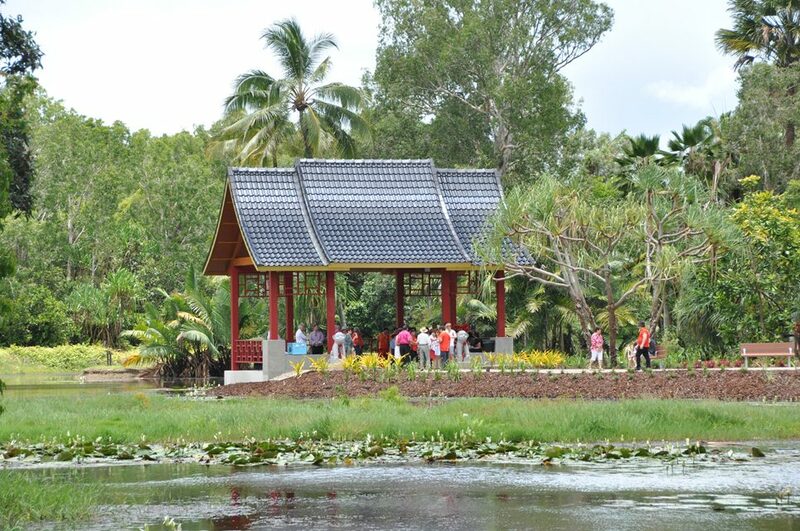 The Chinese-style garden at Freshwater Lakes celebrates the Sister Cities relationship between Cairns and the Chinese city of Zhanjiang. It incorporates traditional features in a contemporary style, to reflect the cultural heritage of the Cairns region.